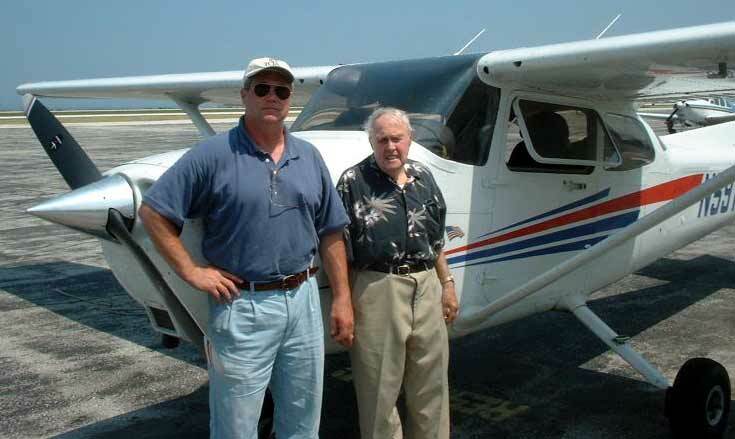 My Dad (read more about Ed Mugridge) used to fly small planes, and it was one of his absolute favorite pastimes. 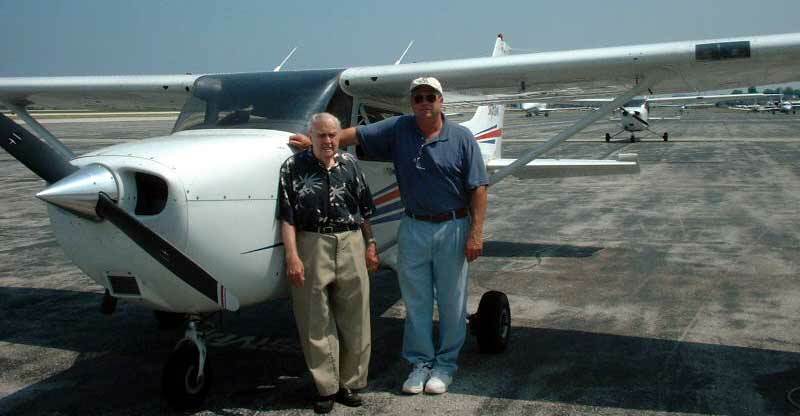 Knowing how much he enjoyed flying, and knowing how long it had been since he had last piloted a plane, my wife, Pat, and I decided we would help him spread his wings once again and lined up a flight out of Burke Airport as a birthday gift. I got the tip from Connie Luhta, President of the International Women's Air and Space Museum (IWASM), which just happens to be in the concourse of Burke Airport. Connie had spoken about the Museum at my Rotary Club's meeting in October of 2004 and had sat at my table for lunch. My Dad used to fly out of Connie and her husband's airport in Concord, Ohio, many many years ago, and she recognized the last name. She asked me if we were related, I said yes, and the rest becomes my story. It's hard to think of birthday gifts for my Dad, and we're always trying to think of something unique. For some reason I thought about Connie's talk at my Rotary Club, and suddenly struck on the idea of getting him behind the controls of a plane once again. I called Connie to ask about setting up a flight for my Dad, and she suggested AirSports Aviation, one of the flight instruction companies located in the Burke Airport. For his birthday we printed a photo of a Cessna 172, one of my Dad's favorite planes to fly, and included it with a card announcing the flight, including lunch, as our gift. This was back in March, and we decided we would wait until better weather before making the arrangements. I had been joking that maybe I would also take a flight lesson. My mother-in-law decided that, since my birthday is close to my Dad's, she would give me a flight as my birthday gift. As time went along, we decided Friday, June 10th, would be the day we would take to the air, so I made an appointment for 2 consecutive sessions. June 10th arrived. A hot, humid, hazy day, we arrived at the airport around 10:30 a.m. to check in and fill out paperwork. Our pilot, Adam, was out on a flight so we visited the IWASM for a little bit. If you're ever in the Burke Airport, be sure to visit the Museum. It chronicles women's long-time involvement in the air and space programs, and is quite fascinating. Some exhibits are in the lobby and hallways, some are within their office. We checked back in at the flight school and learned our pilot was out doing a pre-flight check of none other than a Cessna 172 SkyHawk! Originally we were going to take individual flights, but they offered to fly us both at the same time, taking turns at the controls. My Dad went first while I sat in back, videocam and digital camera at the ready. 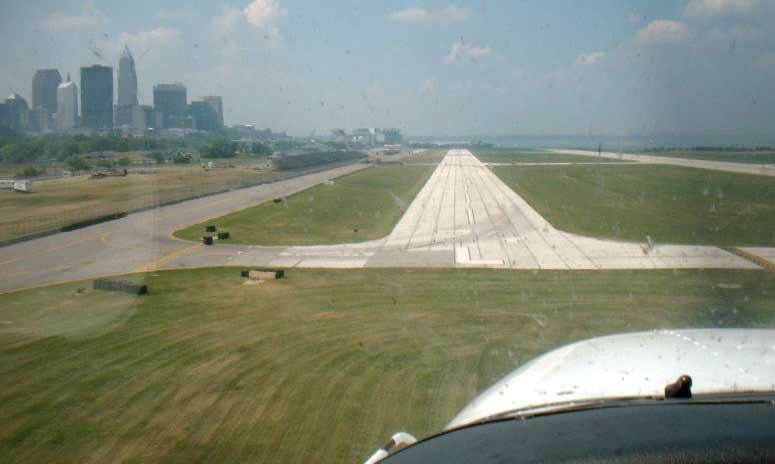 We taxied to the runway and after receiving clearance from the tower, my Dad gave it full throttle, we gained speed, and took off effortlessly. 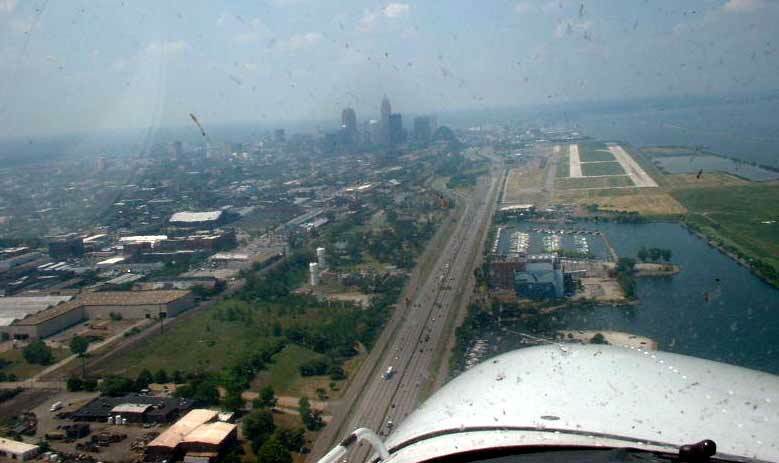 Hearing the hum of the engine and the whir of the propeller as the ground suddenly shrinks away while you take off in a small airplane is an incredible experience. It's nothing like taking off in a commercial jet - it's much more intimate than that. Instead of feeling like a passenger, you feel like you're a part of the plane itself. 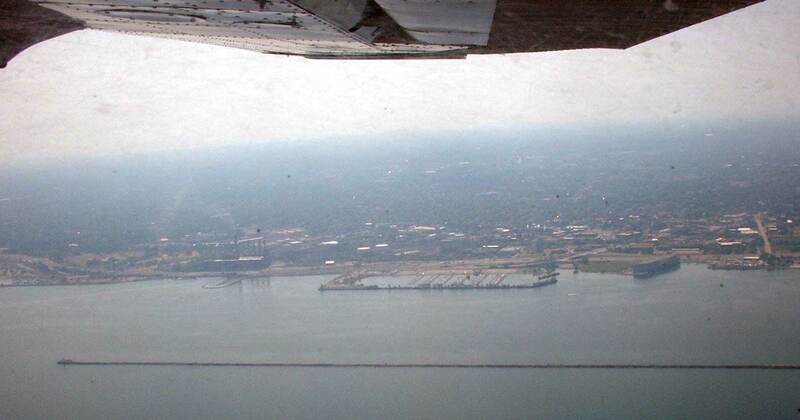 We banked right and headed east over Lake Erie, following the shoreline on our right. At 90-100 knots (103-115 mph) you get pretty far pretty quickly, and in about 15 minutes we had reached the power plant stacks in Eastlake. Our flight was half over at this point, so we turned to head back to land and switch positions. Our pilot took over for the landing. My turn. My Dad had allowed me to control a plane in the air way back when, but I wasn't sure I was ready to take the plane off (maybe I was and didn't know it), so our pilot took care of that. I did do some taxiing, though. On the ground you have to steer a plane by using foot pedals to control the rudder, so it's truly a "Look, Mom, no hands!" kind of thing. 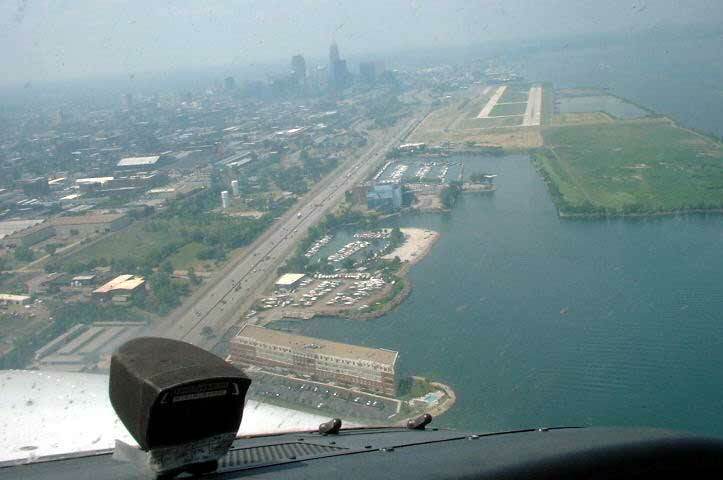 After receiving clearance once more, we left the ground, banked east and headed over Lake Erie for the Eastlake stacks once more. Once aloft, I was handed control with instructions to keep the throttle at 2,300 rpm, bring it to 2,500 feet, and hold it steady there. I did pretty good keeping it at 2,300 rpm because the throttle locks wherever you leave it, sort of like cruise control. I did eventually get us up to 2,900 feet, though (my Dad said afterward that I did what I always used to when I went flying with him - climb!). I asked our pilot how long he'd been flying, how he got interested in flying, etc. Turns out he is from Pittsburgh and went to Kent State. He said, "I suppose I'm sitting next to a Browns' fan." I said, "Yes, and you're lucky we need you to land this plane, otherwise�"
Those first 15 minutes passed much too quickly. We had reached the stacks, so I banked right to head back to the airport. We were alerted by the tower to look out for another aircraft portside. We finally spotted him low at about 9:00 o'clock, and he landed just before us but on an adjacent runway. Flying a plane is an experience that can't be described in words. It's unlike driving a car or riding a bike. You're floating through the air at a high rate of speed, but you don't really feel how fast you're going because there's nothing much to compare yourself to. It takes concentration, too, to make sure you're at the correct altitude (something I obviously find difficult to do) and heading, and because you have to watch out for other aircraft. After our adventure we chatted with our pilot for a while and I picked up some information on pilot training. Who knows, some day I might be doing a pre-flight check, getting ready to take someone up for their first flight. We visited the IWASM once more and left a note for Connie that we had stopped in. We had lunch and talked about airplanes. I think we both had a great time. I know I did, and I look forward to another flight some day!